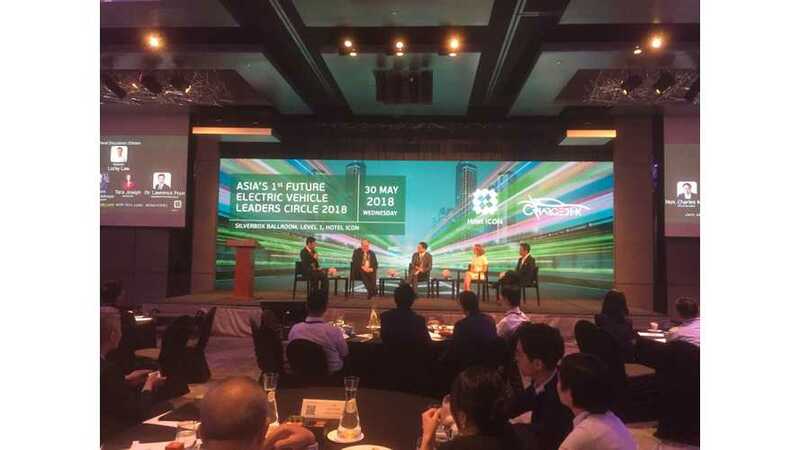 Hotel ICON in Hong Kong recently hosted Asia’s 1st Future Vehicle Leaders Circle in collaboration with Charged Hong Kong. 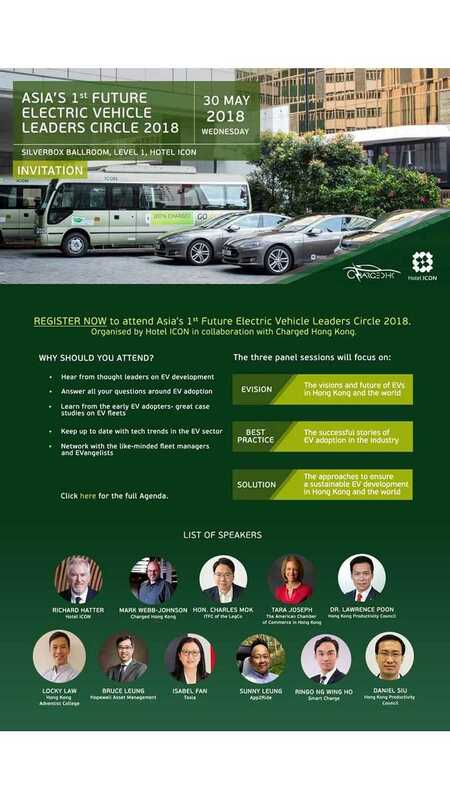 The event was successfully held in this Eco-friendly hotel with a number of influential and key industry leaders participating in several panel discussions to exchange a wide range of EV topics. The venue itself is an icon in the industry for leading to reduce carbon footprint and was awarded with the CarbonCare Label. It is also the first hotel in Hong Kong to electrify their hotel fleet. Although the event focus was towards a feasible solution of deploying EV for the commercial sector, many of the topics are quite relevant to the entire EV community. Richard Hatter, General Manager of Hotel ICON sharing their hotel's uphill battle experience to become the first hotel in HK to deploy an electric shuttle bus fleet. Richard Hatter, General Manager of Hotel ICON kicked off the event with an introduction of this special hotel with a purpose, adding it is also a teaching hotel working with the industry to provide talent and innovative solutions. Some of the solutions include paperless check-in, ORCA system to turn waste food into water and the electrified hotel fleet including BMW i3, Tesla and an electric shuttle bus. He also shared with the audience their uphill battle story when the hotel was trying find a solution to electrify their shuttle bus few years ago. It was not a walk in the park where they can go straight to a dealership to order a bus as no such vehicle type was available in a fully electric platform. At the same time they had to work with the transport department to apply for an appropriate license for such vehicle that does not exist. In the end, they found a mainland Chinese manufacturer "WUZHOULONG MOTORS" to build a prototype that meets their seating capacity and range requirement. As expected, being a pioneer to run the first electric shuttle bus of its kind in Hong Kong road condition was not a smooth sailing. In the beginning, the shuttle had to be frequently serviced until the manufacturer could iron out the issue of their prototype model. After nearly two years in operation the shuttle has now become one of the most reliable vehicle in its fleet and guest have been giving positive feedback with their emission-free ride. With the recent release of the second generation shuttle bus, The Hong Kong Polytechnic University (Hotel ICON owner and partner to its School of Hotel and Tourism Management) has purchased two new model for their campus use. The hotel effort has surely paid off, now with a complete fleet of practical and operational electrical transport fleet, along with it is an experience blueprint that other hotels can reference. Advancement in the local EV market has been stalled after the removal of full waiver of the first registration tax at the end of March 2017. Sales numbers of EV have plummeted to double or even single digits from over hundreds per month. It was not until a year later a slight change in policy to offer a trade-in option that will allow current ICE vehicle owners to purchase a new EV with higher tax wavier topped at HKD250,000 (USD 32,000) but with the criteria that the ICE vehicle is at least 7 years old, it has been registered to the same owner for at least 3 years and must be scrapped from being road worthy again. The change makes it possible for potential buyers with lower entry cost to driving an EV but at the same time prevent vehicle growth on already congested Hong Kong streets. Car owners have mixed feeling about this new scheme as they believe the topped HKD250,000 is still not attractive enough due to EV price is still higher than ICE counterpart in a similar category. The requirement to have the ICE vehicle registered to the same owner for at least for 3 years is also being questioned as this does not make sense to leave an exhaust pipe pumping out CO2 on the road for another 3 years. Richard Hatter sharing Hotel ICON experience with EV deployment and financial benefits to their operation. I had a chance to speak with some of the attendees and they were all very enthusiastic towards using an electric vehicle to support their business.  The key factor to make a switch is the vehicle must meet its operational needs. Unlike private vehicles where the individual owner may have the luxury to spend extra 30 to 45mins to top up the battery, a commercial vehicle must be ready to move when needed. Some operators had decided to continue to use or purchase pure ICE vehicle rather than hybrid or BEV for some obvious reasons. Many vehicles were not designed from scratch as an EV or hybrid so some of the storage space for luggage has been taken up by either the power-train or battery component. Other attendees from charging solution provider that I have spoken with, offer a number of great solution tailor for the local market or even a great fit for parking garage located in any densely populated urban area. One type of EVSE discussed is a ceiling type unit designed by Hong Kong Productivity Council (HKPC). It is well suited for parking space without adjacent or back wall to wall mount a EVSE unit. The idea is also space saving by keeping all power lines in the ceiling without having to dig out trenches on the ground. At the end of the event, I felt the crowd shows positive outlook towards adapting to the EV platform but with a wait and see attitude. Even though commercial EV still enjoys 100% tax wavier, model selection is still limited in Hong Kong. As for sedan type EVs, it is categorized as a private vehicle so the tax wavier is minimal even if it's for commercial use. 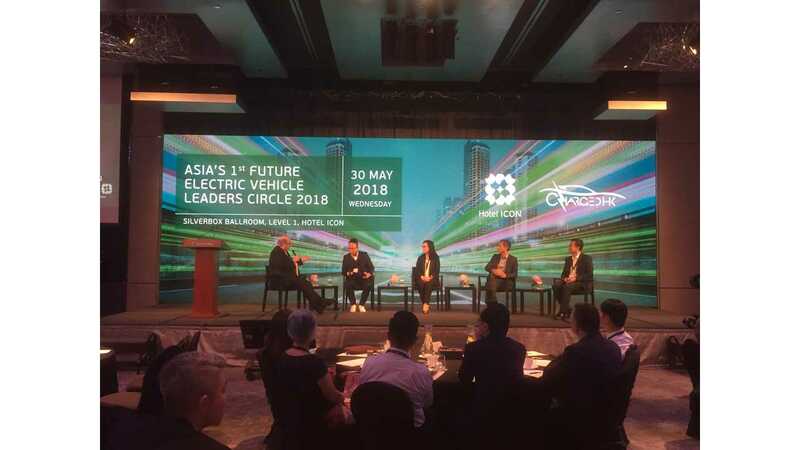 Attendees from the industry also shared insights that foreign manufacturers are very keen to launch their EV platform products in Hong Kong but the lack of private and public charging infrastructure has kept from bringing them to the local market. Hong Kong is one of the most desirable locations to deploy EV solution but unclear government policy and outdated laws do not favor such Eco-friendly movement. If the private sector, including foreign and domestic players, are willing to invest in this area, Hong Kong should make it easier to accommodate such industry and make the city to be a leading sustainable hub. The city already has many of the right ingredients to cook up a great menu of EV solutions but are we willing to push back any obstacles in becoming the next master chef in sustainable transport solution provider?